When making videos with modern gadgets, you just can’t get the same results compared to the old stuff. There’s no atmosphere. 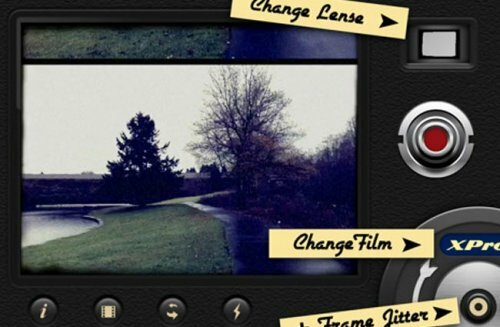 Well, a new iPhone application called 8mm Vintage Camera has been published to the iTunes App Store that allows you to record your movies in vintage 8mm film style. Who needs an actual 8mm camera anymore? With the 8mm Vintage Camera options you can mix and match films and lenses, allowing you to recreate the atmosphere of those days gone by with 25 retro looks. Pretty awesome. 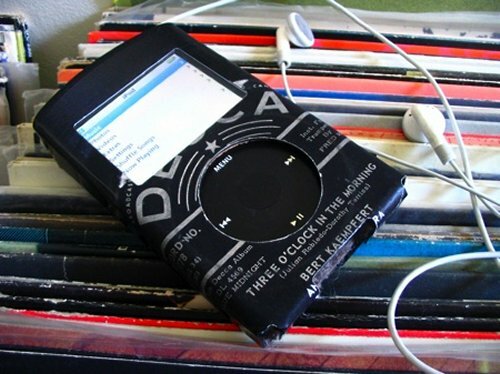 Is this not the best looking iPod dock that you have ever seen? 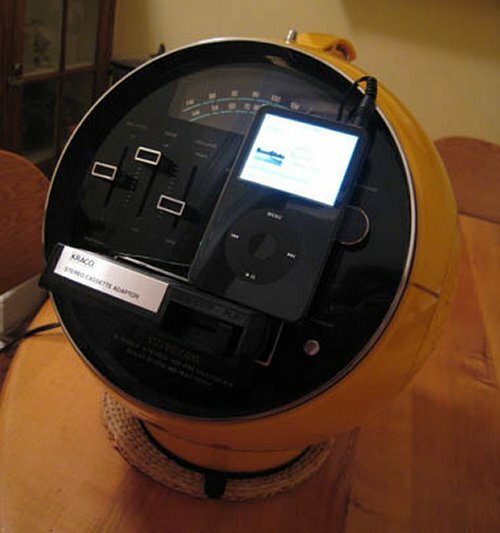 Sure, we’ve seen our share of iPod docks, but this one is a real beauty. It’s a 1958 Arvin Radio that has been converted into an iPod dock. So here you get the best of old and new. The details on the dock are scarce, but we do know that it will cost you $750. At that price, some specs would be nice, but you are buying this more for the style anyway. This one of a kind iPod dock displays either a 1st generation iPhone or iPod touch being docked, so I guess no matter how you look at it, it’s a relic. I love Vintage radios and 8-Tracks. Many just have a retro design that can’t be beat. The kind of style that no one is delivering today. 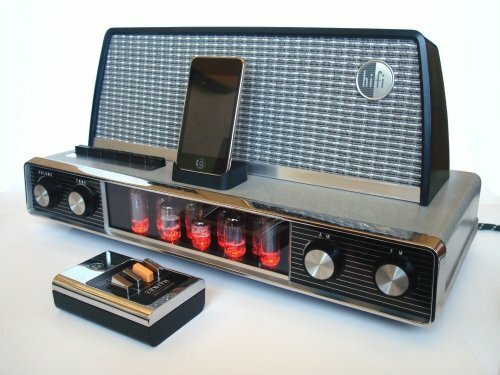 The only thing better than a well designed vintage 8-Track player would be one that was modified as an iPod dock. That’s exactly what we have here. This instructable shows you how to do it. Clearing out an 8-Track’s guts to to hold the contents of an iPod dock isn’t all that hard. The most important thing is that you start off with a great vintage device. If Star Trek had come out in the 1940s this is what the communicator would look like. 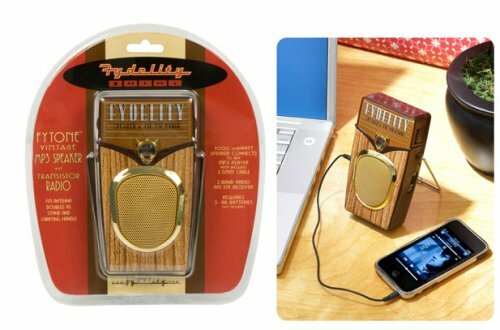 The Fytone Vintage Mp3 Speaker and Transistor Radio is great for anyone who wants their modern tech to have a vintage look. This portable speaker is a throwback to the old transistor radio. It will support any Mp3 player with its 3.5mm cable and also receive AM/FM Channels with the antenna which doubles as a stand. It takes 3 AA batteries and will make a lasting impression on your grandparents. It’s been a while since we’ve seen an awesome geek cake as retro-liscous as this one. 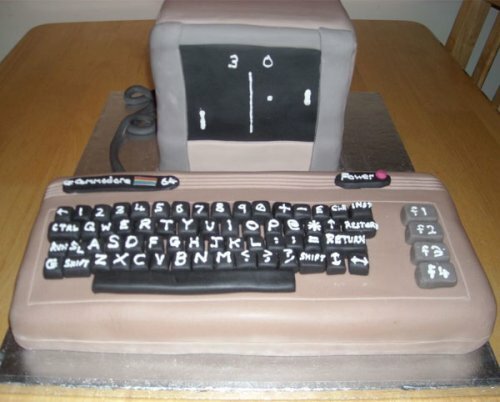 A genuine Commodore 64 Cake. It was made in honor of some guy’s 30th birthday. It has some super nice detail work on the frosting, like all of that keyboard lettering. Even a power cord. Though I don’t remember Pong being available for the C64. It sure looks tasty. This guys wife, who made the cake, is a real special woman and if things don’t work out for them she can make me a cake anyday. If you’ve been reading the ‘Brick for awhile then you know that we dig robots. 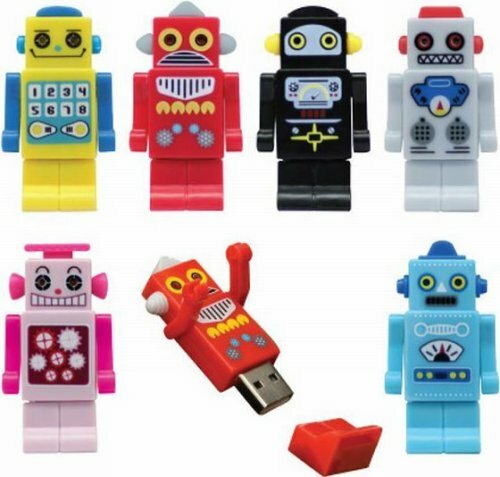 We really love robot flash drives. But as we’ve said before, it’s hard to find decent ones. Well, at last here are some that have true personality. There are six different models in various shapes and colors, all cute,awesome and retro. They come with a 2 gigabyte storage capacity and their LED eyes even light up when you plug them in. There are the six different colors in all: yellow, black, blue, pink, red and white. These little guys are amazing. I’m gonna order one myself. Check out these awesome retro arcade and pinball machines. They’re made for your O scale railroad setup, because let’s be honest, most of your setup is outdated and could use a little gaming flare. The rest of us can use them to decorate our desks. J & C Studios makes them and each 1.75″ tall game cabinet is a snap to put together. Really, they snap together from laser-cut black styrene, and even feature a place to put an LED bulb behind the screen so it can light up. They also offer decal kits for Pac-Man, Donkey Kong, Galaga, Centipede, Zaxxon, Phoenix and Defender. While it won’t impress today’s kids who grew up on Madden NFL, this will be a familiar sight to those of us who grew up in the 70s/80s. It’s an updated version of the LED football handheld we all knew and loved. It’s up at the AppStore. 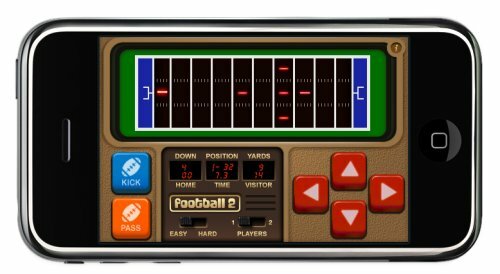 Some new features include running, kicking, punts, field goals and passing. You won’t even have to worry about wear to the plastic buttons or buying a new 9 volt battery. With Passing you have total offense. This is how football was played once upon a time, as blips on a screen. With all of the latest tech news we give you day in and day out, sometimes it’s nice to take a look into the past and honor the devices that paved the way for todays gadgets. This analog computer is known as the AKAT-1 and it can solve complex differential equations in real time and without digital logic. 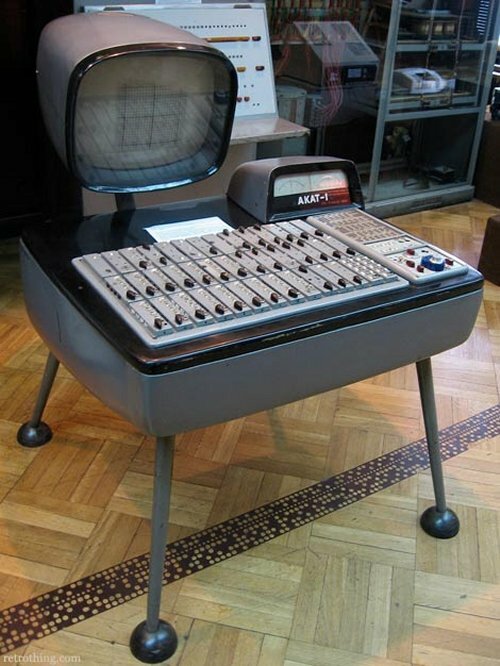 But it’s a victim of time passing by, and now resides in the Museum of Technology, in Warsaw, Poland. You’ll notice it sports a very warm and stunning retro look. It has character. I mean it obviously belongs in a Trek ship, with Spock feeding it data. And yet by many it has been forgotten. We here at the Brick would love to have it in the offices, but our intern would just mess it up. Here’s to you AKAT-1. 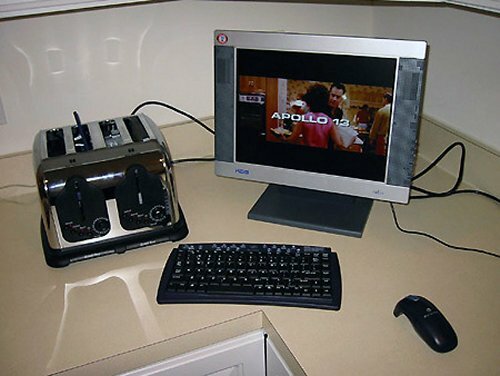 Why anyone would want to put a computer inside of a toaster is beyond me. (As if I never thought about it). And the creator didn’t just stuff a computer into some modern plastic toaster, instead he went the full distance and jammed it in a vintage chrome toaster. And not a 2 slice job, but 4 slice. The only downside is that one wants it to still make toast, maybe with the computer’s excess heat, but alas it has no toasting abilities. 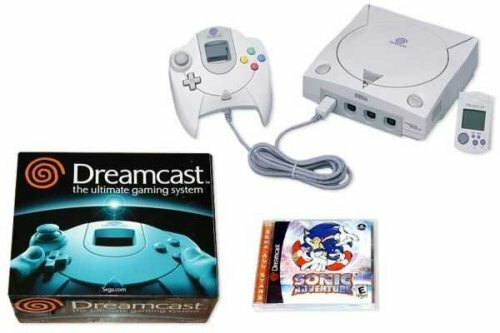 It does have a 3600 MHz processor, 2.5 inch hard drive, DVD-rom drive, and a router inside. It’s what the PC may have looked like in the 1950′s…If toast never existed.